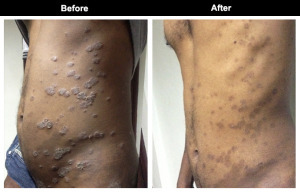 Psoriasis is a skin disease that causes scaling and inflammation. Regularly grow skin cells from deeper layers and slowly rise to the surface, constantly replacing dead cells from the surface. This process is called cell turnover, and it takes about a month. With psoriasis, the cell can happen in just a few days, causing new cells rise too fast and pile up on the surface. Psoriasis begins in the immune system, mainly with a type of white blood cells present in T lymphocytes called T cells help protect the body against infection and disease. In psoriasis, T cells are activated inappropriately, causing activation of other immune responses. This causes swelling and rapid skin cell replacement. People with psoriasis may notice that sometimes the skin improves and sometimes worse. * The patient reacts to certain treatments. By combining topical treatments (those applied to the skin), phototherapy and systemic treatments, you can sometimes use a lower dose of each. Combination therapy can also give better results. Amritha Ayurvedic Health Centre provides Treatment for Psoriasis by Dr. R.S Roy one of the Best Dermatologist in Kerala.